Here’s a quick glance at the provisions in the Senate and House bills and some of the differences. First, the Congressional Budget Office created a quick report that assesses a variety of income levels and whether they’ll come out ahead, tax-wise (blue and white cells) or will lose ground financially (pink cells) under the proposed bill. (See graphic). Under the Senate bill, there would be seven tax brackets (compared with four in the House version): 10%, 12%, 22%, 24%, 32%, 35% and 38.5%. The threshold to reach the top rate would be raised from $418,000 (single) or $480,000 (joint) to $500,000/$1 million. The Senate bill raises the standard deduction to $12,000 for singles and $24,000 for joint filers, compared with $12,200 and $24,400 in the House version. The Senators decided to keep the mortgage interest deduction as it is today, rather than (House version) limit the amount of mortgage debt upon which interest can be deducted to $500,000. 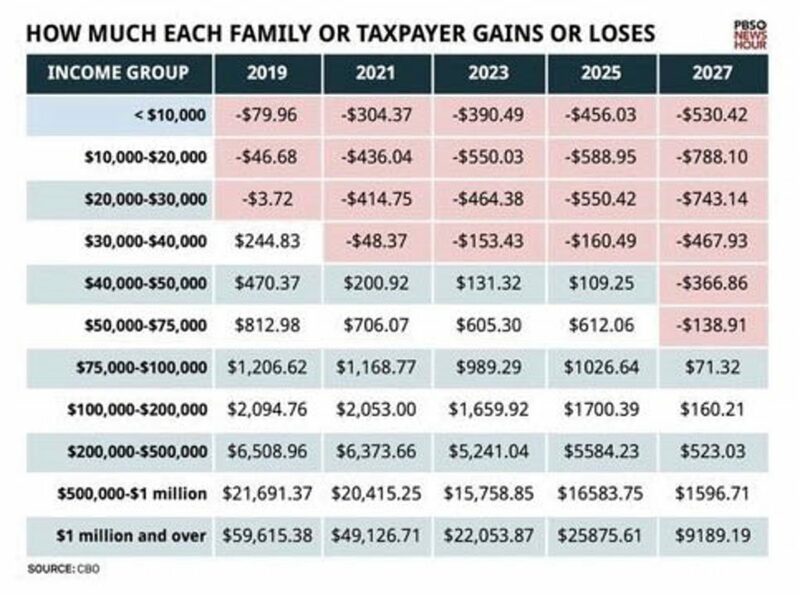 Meanwhile, the House repealed the alternative minimum tax, but the Senate decided to keep it, although it did propose to raise the income exemption levels from $50,600 (single) or $78,750 (joint) to $70,600 and $109,400 respectively. Both versions would raise the estate tax exemption to $11 million for individuals and $22 million for joint filers, but the House version would repeal the estate tax altogether in 2024, while the Senate version would not. Like the House, the Senate bill would eliminate many popular deductions, including state and local income taxes, casualty losses, and unreimbursed employee expenses. It is possible that the final version will greatly reward taxpayers who own and receive income through so-called “pass-through entities;” that is, corporate arrangements where the taxes are calculated and paid by the owners rather than at the corporate level. This includes partnerships, Subchapter S corporations and limited liability companies, which under the Senate bill would be taxed at a rate of about 29.6% rather than the top rate, whatever that turns out to be. Interestingly, this lower rate is also extended to publicly-traded pass-through vehicles—which suggests that you might see a lot of new tax-advantaged investment products come on the market if the bill is passed. Speaking of publicly-traded entities, companies with significant earnings outside the U.S. will also receive a generous tax break; under the Senate bill, they would be able to bring their earnings home at tax rates ranging from 7.5% to 14.5%—lower than the proposed new 20% corporate tax rate. The consolidated bill is expected to be signed before the end of the year—and of course the professional community is watching closely to calculate the impact on all of us.